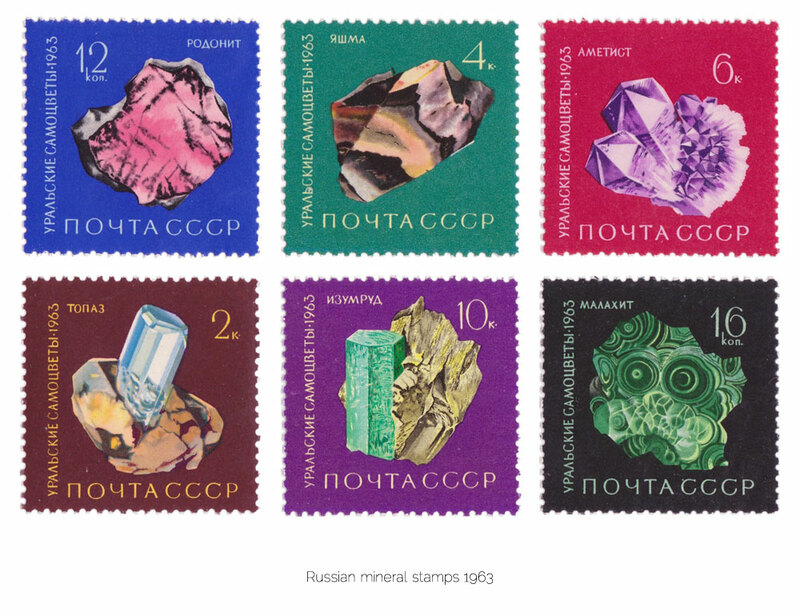 These beautiful stamps come all the way from Russia. Look at that malachite! Jessica is one of the many amazing people I met while studying in New York. We took the jewelry design course together and became friends by sharing our mutual love for jewelry. She was actually one of the people that inspired me to take the full graduate gemology course because she enjoyed it so much herself that I just had to see what it was all about. She is an amazing designer, so dedicated and talented, as well as the friendliest person you’ll ever meet. Amazing fact: Jessica was learning English at the same time she was taking the GG course (which is very intense and technical) so she would do the course reading along with a dictionary! She studied for hours each night for the whole six months. That kind of determination and drive was very humbling to me, and of course she passed the class with flying colors. I work as an independent jewelry designer, which means I have to go through all the process, from buying stones, designing, co-working with bench jewelers and making sales plans. I also do all the graphic design by myself, like brochures, posters, and sometimes take jewelry photos, too. I’d been doing graphic and web design in Taiwan for years before I moved to China with my family 8 years ago. My family runs a jewelry business in Shanghai, mostly dealing with jadeite. I was asked to help design jewelry for our customers. During that time, I found myself really enjoying it and wanted learn more about jewelry. So I went to New York, studied gemology and jewelry design, and then went back to Taiwan, and applied for the Jadeite appraiser program. After all these were done, I decided to move to China again, and started my new career as an independent jewelry designer. Obviously the material I use most in my creations is jadeite, and I do love it. Because of my family’s business, I got to know about jadeite since I was very young. 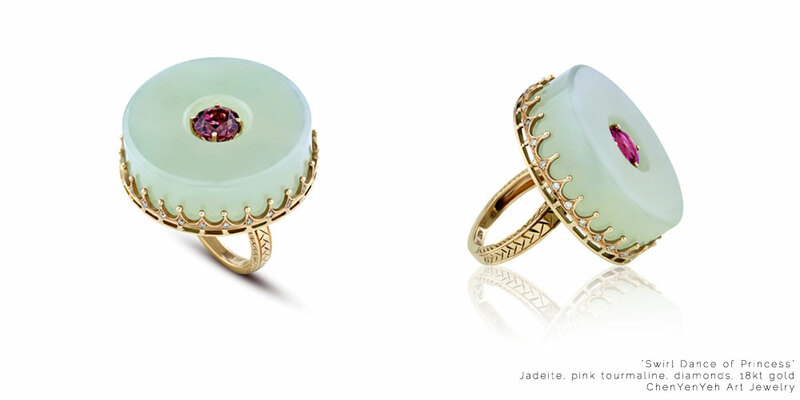 Each jadeite piece has completely its own characteristics and history. I guess that’s also why jadeite is always considered to be very traditional, like something your mom or grandma would wear. But I just see another world out there. Jadeite is an extraordinary stone, it can be green (which people think is the only color), but it can also be red, white, purple, black, yellow, and from transparent to opaque. It’s not necessary to me to connect jadeite with classic Chinese style, I’d like to dig out more of jadeite’s possibilities, let it be the next rock star. Besides jadeite, emerald is also my love. It has fascinating inclusions, like a mysterious garden inside a tiny glassy box. Who wouldn’t love it? What has been the most exciting piece you have made so far? That is a ring called “Swirl Dance of Princess”. The main stone is a large cylindrical pale green jadeite piece with a big hole in the center. It’s the remaining part from the rough stone which was cut to make a jadeite bangle. Usually people use the piece to make a pendant, because it’s too big and heavy to fit other items. I was actually also thinking to make it a pendant at first, but then realized that wasn’t the way I wanted to go. So I changed the original design, and spent a while finding a perfectly matched stone to set inside the center hole: a hot pink tourmaline. When they were set together, I could see a totally different way from what jadeite jewelry always looks like. It was an exciting moment, even though the ring may not be practical for wearing, I knew I just accomplished a great experiment. You find different excitements in each stage. There are two parts I found myself more into: buying stones and doing design. Just think about this: there are rows of alluring stones lying on the table, and you can pick one (or a few) to take home with you! How could it not be exciting? Design is all about the desire to show people how you feel and try to express that through your work. It’s delightful to see when people are amazed or inspired by my jewelry. What is a recurring theme you like to explore in your work? I like to build a scene in my jewelry. It could be a copy from the physical world, like imitating nature. It could also be a fraction of an image from my daydreams, like something about the universe or fairyland. I get most inspirations from outer space, I have to say: space is endless, the deeper you go into it, the less you can control, and that makes me feel dizzy and fearful. However, that complex sensation seems to encourage my creativity the best. I’d been thinking about how to do the actual business without my family since I came back to Asia. And I’m lucky that I have two friends who own jewelry shops. They decided to carry my jewelry brand as distributor, one in Shanghai, another one in Taipei. The one in Shanghai is very important for me, the owner is not just my best friend but also my classmate from GIA New York. She is connected with the ELLE online shop of China, and sells my jewelry online as well as in the store. That’s how I started, but I’m thinking of more solutions to sell my jewelry over the world, like attending jewelry fairs in different countries, or making my brand’s online shop. I kept a ring for myself from my most important collection: “Simply Jadeite”. That’s the first time I tried to make the whole jadeite jewelry collection with silver. People here think that jadeite should always go with gold or platinum, because silver would decrease the value of jadeite and then no one would buy it. But I really want to introduce jadeite to younger generations, make jadeite jewelry more trendy and affordable. So I made this collection, and now they’re the most popular items among my work. It really means a lot for me. And the reason I love it so much is not just because of this, but also because it reflects my philosophy: Life is sometimes twisted and complicated, but anyhow we still insist to live simple, live straight, live easy. Thank you Jessica, your work is beautiful as always! Now I’m inspired to go practice my hand sketches, how about you guys? To see more images of Jessica’s work, go find ChenYenYeh on facebook.